Why Pay $395 for Co-Working Office, When you Can Have Semi-Private for Same Price or Less? Why pay $395 for a Co-Working Office When you can Have a Semi-Private for the Same Price or Less? Co-working has become a big trending word and new businesses are flocking to these locations because they believe this is the new way to do business. Unfortunately, they are not doing themselves a favour and they are looking bad doing it. Here are some reasons why the co-working trend is not good for a small business or start-up company. Having a business address is important; but having a business address with a P.O. box number or at a retail location makes customers question you legitimacy. Remember, in this day and age customers will Google your location – and if they see it is a storefront that looks like a over-priced coffee shop, will they take you seriously? When your customers look up 1 Yonge Street, they see a professional business building that tells them you indeed professional. 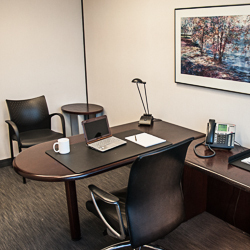 When you want a private meeting with a client, are you paying extra for a meeting room at a co-working office space? Why would you pay extra when you already paid $395 ? At that price meeting rooms should be included! They are with a semi-private office. With a semi-private office at Telsec, you are free to use boardrooms and meeting spaces at no extra charge. Next, there is no place to keep your private files or store your computer. Yes, co-working spaces are very public and you get the space that is available and you need to carry your computer home every time you visit. With a semi-private office, you can leave your computer on the same desk and it is secure. Did someone just read that draft you printed? Far to often with co-working spaces that offer public printers, someone else can see what you printed before you get to the print room. With Telsec’s semi-private offices, you can set a password or pin so that your print job does not appear until you put your code into the printer. This keeps your print job private. We have more reasons that our semi-private and even our shared office options are better than a co-working space – and at a better price! Just keep following our blogs.